During the two years between mid 1933 and mid 1935 Rakusan produced a series of one hundred eighty individual woodblock-printed fan designs. These fan designs are printed as negative images with a single impression of black ink. 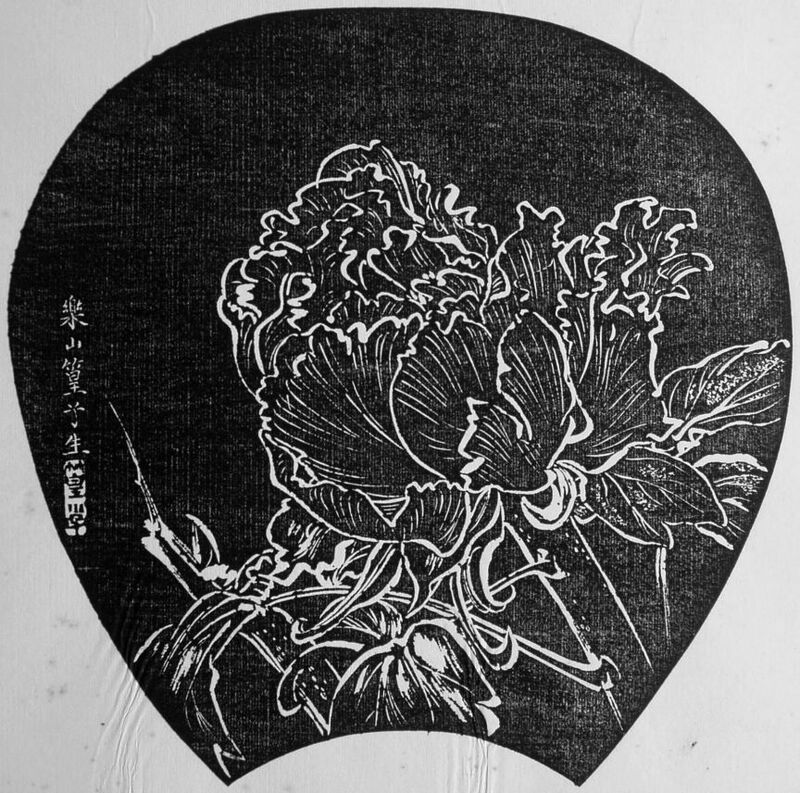 Although all are actually woodblock prints, this traditional negative-image printing style is called 石摺(り), ishi-zuri, lit. 'stone rubbing', from its superficial resemblance to that technique. Rakusan called this series 篁子生石摺画選, Koushisei Ishizuri Gasen, lit. 'Koushisei's Stone-rubbing Print Selection', but it is usually called here the Fan Series. Rakusan did not include the Fan Series in his main sequence numbering. Therefore, the original number used for each of the 36 Series prints has been modified to identify the Fan Series members of its theme. The five different fan silhouette shapes have been here assigned arbitrary numbers 1 through 5. To indicate a fan design these shape designations are added to the 36 Series number separated by a hyphen. 117-4 is the Fan Series design with fan shape 4 in the 117 Winter Tree-peony theme. Like all other designs in this series, 117-4 was only produced in a single print run, and few copies are currently documented. The 117 Winter Tree-peony theme is one of the many entirely regular themes represented by a complete fan quintet and a color woodblock print. The Fan Series designs of the 117 Winter Tree-peony theme were printed during September 1934 and were distributed September 15, 1934 as installment six (of twelve). 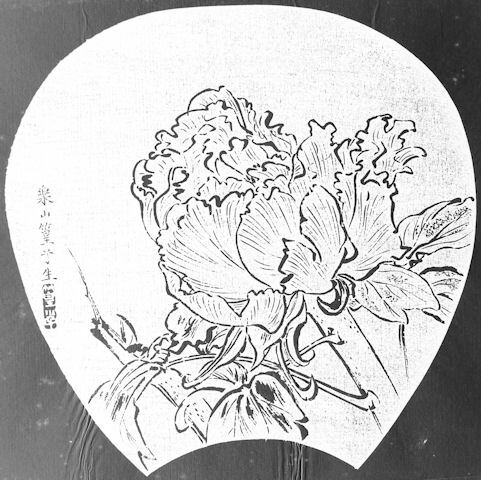 On the delivery documents Rakusan used the theme subject title 寒牡丹, kanbotan, 'winter tree-peony' which is probably the original title of 36 Series design 117 published at the same time. Earlier in the 36 Series Rakusan had created another tree-peony theme. That earlier 103 Tree-peony theme is also perfectly regular in arrangement and content, but each of those designs bears early signature and seal markings. The designs in the two tree-peony themes also differ in execution with the petals in the 117 Winter Tree-peony theme filled with scribed parallel lines, and those in the 103 Tree-peony theme more silhouette-like. The 103 Tree-peony theme represents a separate earlier addition to the series which (apart from its shared subject) is entirely distinct from the 117 Winter Tree-peony theme. At least some of the designs in the 117 Winter Tree-peony theme were adapted from sketches originally created in the late 1920s during the planning of design 11 in the earlier 100 Series (see below). Similarly, the designs in the 103 Tree-peony theme were adapted from sketches for design 10. 117-4 and all but one of the other designs in the 117 Winter Tree-peony theme have seal C, including the 36 Series design 117. This suggests that all of their wooden blocks were carved during the first half of 1934. Rakusan deliberately delayed printing for several months after those blocks were ready. 117-1, the remaining design was carved later to complete infilling the quintet, perhaps only just before publication. The composition of 117-4 includes a tree peony branch with a large, half-opened bud. All of the design elements are rendered as detailed line drawings which look equally well viewed as ishizuri or in the original. Tree-peony, Paeonia suffruticosa, 牡丹, ぼたん, ボタン, botan, now comes in many colors, shapes, and varieties. Winter-blooming Tree-peony, Paeonia suffruticosa var. hiberniflora, 寒牡丹, kan-botan; or 冬牡丹, fuyu-botan; both lit. 'winter tree-peony', is the earliest-blooming variety of tree-peony and typically begins to bloom before the winter snow has melted. Therefore, to protect the new growth the plants are typically staked and often protected from the weight of the snow by a woven grass mat as a kind of open tent structure.